Lewis Grabban and Yann Kermorgant both scored twice as Bournemouth ended Nottingham Forest's Championship play-off hopes in emphatic fashion. The Cherries, whose own slim chances of a top-six finish also vanished because of other results, deservedly led at the break when Kermorgant headed home. Grabban's shot made it 2-0 and the striker's penalty made it 3-1 after Greg Halford had headed in for Forest. Kermorgant sealed victory when he blasted the ball home late on. Bournemouth had all but slipped out of the play-off picture after failing to win any of their previous three games. Lewis Grabban has scored 22 goals this season, while Yann Kermorgant has scored nine for the Cherries since joining from Charlton in January - taking his season tally to 17. And despite needing a win and an unlikely set of results to keep alive their chances until the last day of the season, their lively start suggested they had no intention of missing out through their own shortcomings. Matt Ritchie had the home side's first chance in the second minute with a decent drilled 18-yard strike, and Grabban missed a volleyed chance after being teed up by Kermorgant. Forest who had won their last two games to get their own promotion challenge back on track, could have gone ahead when Matt Derbyshire shot straight at former Reds goalkeeper Lee Camp after being sent through by Halford. But Bournemouth had dominated possession and finally made that count two minutes before half-time when Kermorgant bundled a header in to the net from a superb Simon Francis cross. Two minutes after the interval it was 2-0 when Grabban swept the ball home after good work by Eunan O'Kane. Halford got the visitors back into the match, powerfully heading home Ben Osborn's free-kick. And Forest missed a great chance to level when Halford wastefully skied an effort over the bar from close range following an Osborn corner. The Cherries made Forest pay when Grabban netted his 22nd goal of the season from the spot after substitute Gonzalo Jara tripped Marc Pugh. Kermorgant then added a fourth - and his ninth Bournemouth goal since joining in January - when he fired the ball past Dorus De Vries after good approach play from Tokelo Rantie and Ryan Fraser. "We were excellent in the first 15 or 20 minutes and all that was missing was a goal to show for it. Our overall performance was top class against an excellent side. "Once we had gone ahead I felt we were always in control even after Nottingham Forest had pulled a goal back from a set-piece. We have come a long way this season. We took some heavy beatings early on, which was all part of the learning process. "I like to think we know have threats all over the pitch and always look like we can score goals from any direction. "I don't feel any sense of huge disappointment as it is not as though we have dropped out of the top places. We arrived late on the scene and we have to hope we can take this momentum into next season." "It was a disappointing day. I thought Bournemouth were much better than us. In the first half we did what we wanted to do, to make sure we made it hard for them to score. "We did that well right up until just before half-time where we let them get into the game. We didn't defend the cross, and they get a goal up. "You can see straight after half-time the game got away from us. We get ourselves a goal off a set-piece and potentially could have got another off another set-piece. "The penalty really took the game away from us and we are chasing from there. I've no complaints about the result, they were the better team and they looked like a settled team who have a very settled style of play. It was tough for us to play against them at times today." Match ends, Bournemouth 4, Nottingham Forest 1. Second Half ends, Bournemouth 4, Nottingham Forest 1. Corner, Nottingham Forest. Conceded by Tommy Elphick. Darius Henderson (Nottingham Forest) wins a free kick in the attacking half. Substitution, Bournemouth. Mohamed Coulibaly replaces Matt Ritchie. Goal! Bournemouth 4, Nottingham Forest 1. Yann Kermorgant (Bournemouth) right footed shot from the right side of the box to the bottom left corner. Assisted by Tokelo Rantie. Jamie Mackie (Nottingham Forest) wins a free kick in the defensive half. Attempt blocked. Matt Ritchie (Bournemouth) right footed shot from outside the box is blocked. Corner, Bournemouth. Conceded by Jamie Mackie. Substitution, Bournemouth. Tokelo Rantie replaces Lewis Grabban. Offside, Nottingham Forest. Lee Peltier tries a through ball, but Simon Cox is caught offside. Simon Cox (Nottingham Forest) wins a free kick in the defensive half. Attempt missed. Simon Cox (Nottingham Forest) right footed shot from outside the box is high and wide to the left. Assisted by Darius Henderson. Offside, Bournemouth. Marc Pugh tries a through ball, but Lewis Grabban is caught offside. Daniel Harding (Nottingham Forest) is shown the yellow card for a bad foul. Substitution, Nottingham Forest. Darius Henderson replaces Stephen McLaughlin. Offside, Bournemouth. Andrew Surman tries a through ball, but Lewis Grabban is caught offside. Offside, Nottingham Forest. Daniel Harding tries a through ball, but Simon Cox is caught offside. Goal! Bournemouth 3, Nottingham Forest 1. 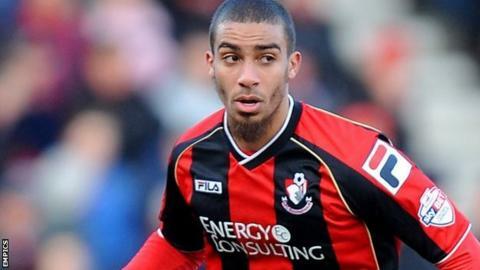 Lewis Grabban (Bournemouth) converts the penalty with a right footed shot to the bottom right corner. Penalty Bournemouth. Marc Pugh draws a foul in the penalty area. Penalty conceded by Gonzalo Jara (Nottingham Forest) after a foul in the penalty area.